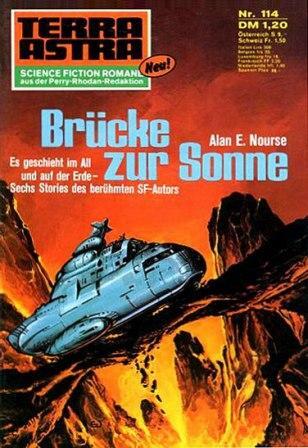 First edition ("Neu!" is stated on the cover). Apparent first (and likely only) printing. Although the publication claims to be the German translation of Tiger By The Tail, it actually contains one story from The Counterfeit Man, i.e. "Circus". Translated by H. P. Lehnert. "Oktober 1973" stated in the copyright section on p. 65. Day of publication deduced from the weekly publication schedule and nos 112-116 all being from October 1973. Published simultaneously with Perry Rhodan #634 and Atlan #107. Attention: the page count starts with the cover and the pub. has no ISBN, since it was not available in regular book shops. 'Terra Astra report' is on pp. 3f. and features a preview for upcoming publications. No credit for the cover art but the artwork is signed "EJ". Other prices: S 9.00 (Austria), Fr 1.50 (Switzerland), Lire 300 (Italy), frs 20.00 (Belgium), frs 18.00 (Luxemburg), FF 2.20 (France), hfl 1.40 (Netherlands), Pts 38.00 (Spain).